What is it about mid-April and violence in America? He says conspiracy theories are "a contemporary mythology, not unlike the Greek gods"
Nearly 20 years ago, 76 people lost their lives during an FBI raid near Waco, Texas. CNN's Drew Griffin looks at those events at 8 ET/PT and 11 ET/PT Saturday night in "Waco: Faith, Fear & Fire." -- April 19, 1993: the FBI's siege of the Waco compound leaves 76 dead. 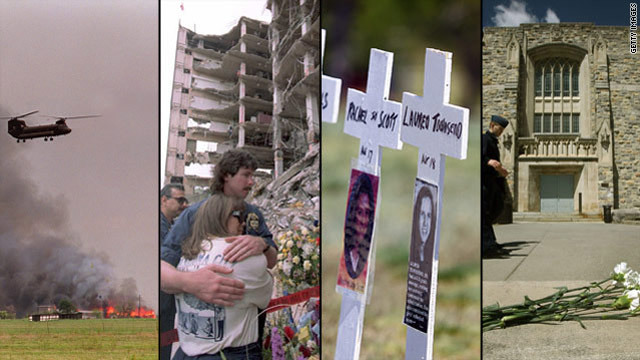 -- April 19, 1995: the bombing of a federal building in Oklahoma City kills 168 people. -- April 20, 1999: A mass shooting at Columbine High School leaves 15 dead. -- April 16, 2007: The Virginia Tech massacre kills 33. The Oklahoma City bombing was timed to coincide with the Waco anniversary. And it's unclear whether the Columbine shooters timed that attack to mark Adolf Hitler's birthday or possibly Waco. Is there something about this time of the year that makes these types of attacks more prevalent? For an answer, CNN spoke with Robert Blaskiewicz, a professor at the Georgia Institute of Technology in Atlanta. He teaches a course examining conspiracy theories and runs a blog, called Skeptical Humanities. CNN: Is there any evidence or are there any theories that suggest attackers are more likely to strike around this time of the year? Robert Blaskiewicz: I have seen nothing to suggest that anything about April itself makes people violent. That said, the reason why we see certain types of political violence in mid- to late April is because of a few unhappy coincidences: that Waco happened to fall on the anniversary of the Battles of Lexington and Concord, the first battles in a war against a tyrannical oppressor. For many people who labor under the idea that the federal government is a tyrannical foreign oppressor like the British monarchy, Waco symbolizes a war of a government against its people. [Timothy] McVeigh chose to bomb the Murrah Building [in Oklahoma City] on the anniversary of Waco because of that symbolic importance (indeed, the forged drivers license he rented the truck with had the date of issuance as 19 April 1993, the date of the Branch Davidian fire). If you want to squint, you might also lump in the opening of the Civil War to this part of the year, but the timing of that was chronologically tied to events following Lincoln's election, not the Revolution. Regarding the Virginia Tech shootings, my first impression is sheerest coincidence. Now, by raising this question, I think that you illustrate an important principle behind the conspiratorial mindset (something that actually undergirds even normal psychology), and that is seeing patterns in unrelated events. Seeing a cluster of completely unrelated events fires up the conspiracy theorist's mind. I have recently seen speculation about four different television personalities who recently have displayed incoherent speech during taping (including a news reporter and Judge Judy). Conspiracy theorists made the leap that they were all related and that there was probably some mind-control weapon being used. Go figure. CNN: How strong are the beliefs/outrage surrounding the Waco disaster, nearly 20 years after the siege? Blaskiewicz: I don't have a sense of the strength of the feelings about Waco specifically; however, after Oklahoma City, the numbers of militia groups dropped. Following the election of [Barack] Obama, however, there was a steep rise in the number of hate groups, which has been ably tracked by the Southern Poverty Law Center and the Political Research Associates. Interestingly, last year on the 19th of April, gun advocates had a rally in Washington (a sort of "bring your guns to the Capitol day") to rally behind the Second Amendment, even though the Second Amendment has not really been on the Obama administration's radar at all. For a while, it was difficult to even buy ammunition, since terrified gun owners started stockpiling it. [April]19th has become a sort of high holiday for those who think that they live under the thumb of a tyranny. Nonetheless, in the mythology that has grown up around Waco and Oklahoma City among self-identified patriots, the 19th has become a sort of high holiday for those who think that they live under the thumb of a tyranny. CNN: What do you think is behind the need to see patterns in unrelated events, such as several attacks that happened all around the same time? In other words, what purpose do conspiracy theories serve? Blaskiewicz: There are several possible answers, and I'm not sure any one answer is better than any other answer. It's extremely useful in building respectful communities. Sometimes that faculty doesn't turn off when it should, and you associate "agency" with events and ideas that are unrelated. When a responsible agent is not easily discernible, that sense that something is still deliberate endures, and you are left wondering, "Well, who caused it, then?" You fill in the blanks. The ill-defined "they," whether referring to the U.N., CIA, international bankers, Jews or interdimensional shapeshifting reptilian space aliens living in the hollowed-out artificial moon (yeah, it's a real one), really seem to me to be a secular version of religious mythology. It's a tendency called confirmation bias, and it is a sort of perceptual filter for what you accept as evidence. Even the apparent clustering of events, in itself, can serve as evidence for someone who is looking for things to confirm their worldview, and allows the conspiracy theorist to discount reams of information that directly refute that belief. Each human brain comes equipped with a whole series of generally useful shortcuts to help us make sense of the immense amount of information that we have to process everyday. Conspiracy theories, I suspect, are simply an interesting (occasionally dangerous) byproduct of those mental shortcuts.